If you have an inkling of talent, a hidden talent, a secret talent, talent that was recognized when you were a child – whatever it may be – use it if you don’t want to lose it. My mom surprised me and sent this in the mail. (see photo). That’s my report card for piano instruction. She had three pianos in her home. An upright in the den, a baby grand in her living room and another upright on the far end of her living room. She would teach two students at once. Moving from room to room within a 30 minute period. Both my brother, Ronny, and I would take lessons together. She was strict. Not easily impressed. Stern. Forthright. Impatient. Passionate. And, at times, a little mean. Madame Chouinard was intelligent. Commtted. A pure musician. Exceptionally talented. Highly reputable in the classical arena. Respected. Honoured. Recognized. Graceful. Classy. In the height of her career, she was a concert pianist. Her husband, before he passed, was the conductor. I remember seeing a photo in her home with Madame Chouinard at the grand piano, her husband at the head of the orchestra and the orchestra members with their instruments. A black and white framed photo. 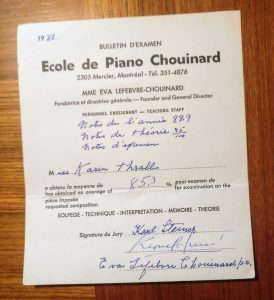 She wore a gown, I remember that..
Madame Chouinard was part of the Conservatoire de musique du Québec à Montréal and instructed me in both French and English, but mainly French. I remember I was required to practice 90 minutes a day. Scales, techniques, theory and ‘the piece’ assigned to me for the recital. A composition by Frédéric Chopin. Chopin was her favourite composer. At the end of our piano season she would host a recital for all her students and family members. She couldn’t have everyone in her home at once, so she’d split the groups up into mini recitals. The students would wait in the kitchen for our cue, while she hosted the families in her living room. She’d introduce each student and the piece they were to play. She taught us how to stand properly by the piano, how to bow politely, how to take our seat, how to place our fingers on the keys, take a deep breath and begin performing a memorized 5 page classical composition. We worked diligently, staff by staff, page by page, until it was fully memorized. My ‘greatest accomplishment’ was the year I performed Chopin – Waltz in C sharp minor, op. 64,2. She called me into the room and I proceeded to the piano. We were never allowed to play on her baby grand – except – for the recital. The thing I remember most is Mme Chouinard’s eyes were teary. I knew she was proud of me in that moment. Something I had never experienced before. In class, she would take her teaching stick and tap my hands when they weren’t placed properly over the keys and she would express her disappointment when I wouldn’t come to class prepared. When she’d go through my theory questions, she could tell whether I studied or not. If I didn’t apply myself throughout the week, she knew it, and would give me a score of “0/100” on my progress report that day. Sometimes we’d work on one bar-line over and over again ‘until you get it right.’ She’d correct me if I didn’t do the arpeggio properly, if my cadence was off, if I didn’t decrescendo to her standards. I’m sure there were a few times I cried. Yet, I deeply respected her and really admired her success. The young teens kicked in, and I got bored. Indifferent. I lost the zest and discipline it took to practice daily. After all, I was far more interested in buying clothes at Le Chateau, playing Atari and talking on the phone with my friends about cute boys (with the long spiral cord so I could bring the phone into my room and close the door). As time went on, my confidence began to wane and over time I no longer remembered those memorized Chopin arrangements. I slowly played the piano less and less. I can read basic sheet music, play basic chords, but classical? Not a chance! When I look at Chopin’s masterpieces, I recognize only the notes, but the arrangement is foreign to me. How talented was I as a pianist? What would have happened if I stayed committed to playing, practicing, keeping my love for classical as a hobby? I would have continued to excel in my ‘hidden talent’, in my ‘secret talent’, in my ‘little talent’. You don’t need an exorbitant amount of talent to become exceptional. A little bit of ordinary is enough to cultivate the extraordinary you. Is it too late? No, not at all. What about you? What talent do you have – even if it’s an inkling, a smidgen, a secret twinkle in your eye – that you’re willing to give a little more of your attention (and heart) (and soul) (and commitment) (and passion) to? I believe, and I’m sure you do too, that investing in your talent is rewarding, life-giving and fulfilling. 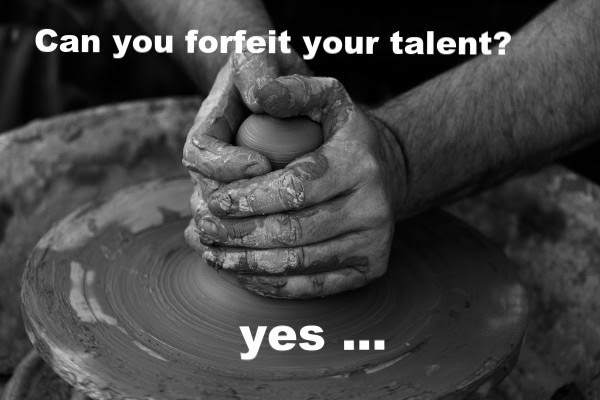 If you truly love your talent, please don’t forfeit it. ps. In the meantime – ummm – there is a little ol’ sport called golf that has captured me l’il ol’ heart. That, my friends, is where I would love to increase my talent. My happy place! I’ve been making excuses to not get out to the driving range. No more excuses, KT! Do what you love! Riiight?!? It has been a million years since we’ve last seen each other in High School. Simply said, reading this and watching your video brought tears to my eyes, when you mentioned how confidence is the key. This is something that I think I have somehow lost along the way, it even took a few times for me to decide to even contact you. Michelle!!!! Wow wow wow. So GREAT to hear from you! When I saw your name, immediately a big smile! Yes would love to chat! I’ll email you. Look forward to it! !